Prince Frederick, Maryland: Recorded Books, 1990. 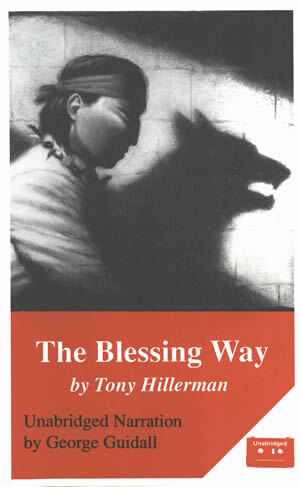 This is the 1990 unabridged audiobook version of The Blessing Way, narrated by George Guidall and published by Recorded Books. It is published on 5 cassettes; listening time is 6.5 hours. The cassettes are in a black plastic case with cover insert. The front of the case features an illustration of a dark-haired man wearing a headband and necklace, sitting against a cement block wall. A light is shining from behind and above him, casting the shadow of a wolf onto the wall. Below the illustration, the title and author name are printed in white on red. The narrator's name is printed in black. On the back of the case, a detail of the front cover illustration sits above an excerpt from the novel. Other text provides advance praise and publication information. The book title is printed on the spine of the case in red, along with the word "Unabridged."